Director – Harvey Hart, Screenplay – Barré Lyndon, Producer – Jack Laird, Photography (b&w) – John F. Warren, Music – Lalo Shifrin, Makeup – Bud Westmore, Art Direction – Loyd S. Papez. Production Company – Shamley Productions. San Francisco, 1890. Brett Kingsford, a specialist in the occult, is brought in by police commissioner Harvey Misbach to consult on The Phantom Killings that are terrorising the city. Brett puzzles over a series of ritual figurines that are left at each of the murder scenes and discovers that these are representations of deities from ancient Sumerian religion. At the same time, Brett’s good friend Robert Vandenburg is about to be married. Brett notices that Vandenburg periodically goes into fugue states and comes to believe that he is being possessed to conduct the killings. Dark Intruder was the one other film from Shamley Productions, a company set up by Alfred Hitchcock on the Universal backlot and responsible for the tv series Alfred Hitchcock Presents (1955-62). Of course, the sole other film under the Shamley banner was a small work that Hitchcock directed called Psycho (1960), Dark Intruder was originally intended as a tv pilot but was not picked up for a full series order and so extra material was added to pad out the running time (even if the finished article still only runs slightly less than one hour long). As a far as I am aware, Dark Intruder was the first example of the occult detective up on screen. The occult detective was created in the 19th Century and popularised by William Hope Hodgson’s Carnacki the Ghost Finder stories. Numerous other writers have dipped into the field, including Robert E. Howard, Mercedes Lackey, Sax Rohmer and others, even real-life occultist Aleister Crowley wrote stories. Dark Intruder would appear to be the first example of the occult detective on the screen predating famous later tv examples like The Norliss Tapes (1973), Kolchak: the Night Stalker (1974-5), Gene Roddenberry’s similar failed pilot Spectre (1977), The X Files (1993-2002, 2016-8) and Supernatural (2005– ) or the Clive Barker film Lord of Illusions (1995) and the character of John Constantine in DC Comics. 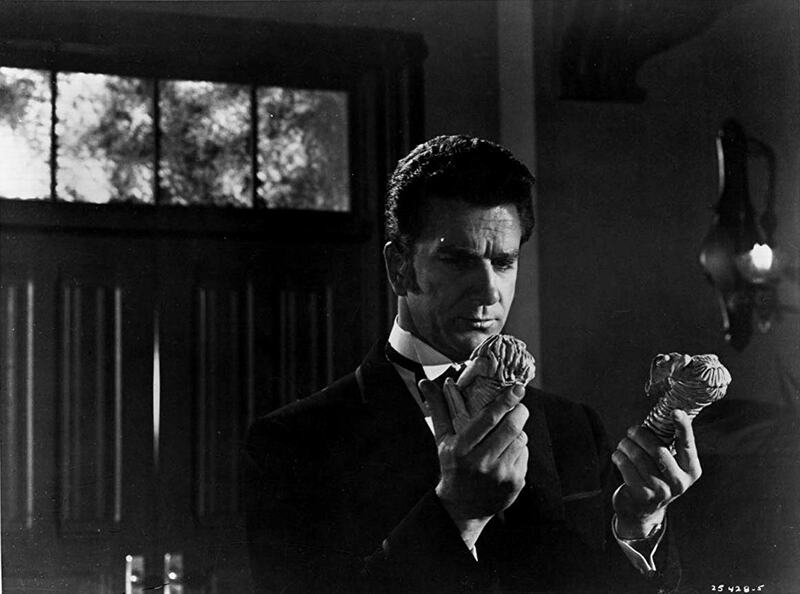 In the role of the occult detective is a young Leslie Nielsen. These days, most people know Nielsen from his comedy roles from the 1980s and beyond where he became the equivalent of a human cartoon figure in the Airplane, The Naked Gun and Scary Movie films and other works in a similar vein such as Dracula: Dead and Loving It (1995), Spy Hard (1996), Wrongfully Accused (1998), 2001: A Space Travesty (2000) and Superhero Movie (2008). It is unusual to see Nielsen not mugging it up for the camera and for once playing a straight role – moreover, to see him as a younger man, playing a dapper gentleman of leisure. The other interesting name in the cast is Werner Klemperer, a former Jewish refugee from Nazi Germany who will always be remembered as the comic foil of Colonel Klink on tv’s Hogan’s Heroes (1965-71), a role he went on to take up only a few months after Dark Intruder came out. Here Klemperer plays the role of Mark Richman’s evil twin brother who adopts the disguise of the fortune teller Professor Malaki. I was surprised what a reasonable film that Dark Intruder was. There are few films that look so good in black-and-white. Director Harvey Hart and his cinematographer create a strikingly brooding atmosphere with their set-ups. Shots are broken up with objects looming in the foreground or occluding the frame – vases, gas lamps, the demon figurines, a fight where the killer’s hand suddenly comes down into the frame as they are about to attack. Or streets scenes that end on shots of lingering ominousness as a clawed hand reaches into foregrounded frame to clutch a rail. Or where Leslie Nielsen throws money on the glass table for Werner Klemperer’s fortune teller, which is shot from beneath the table, looking up through its glass surface as Klemperer’s hands come down to hurriedly clutch it away. The script is okay, although some of the convolutions in its detective story take a little following – I found it difficult to work out the reasons for the string of killings and how they connect up the body theft story we eventually get. Canadian-born director Harvey Hart never did much else of significance. He directed much in the way of tv, both in Canada and the US, including even an episode of the original Star Trek (1966-9). In genre material, he also made the occult film The Pyx (1973) and the tv movie The Aliens Are Coming (1980). The script was one of the last works of British-born playwright and screenwriter Barré Lyndon (1896-1972). Lyndon had success with the Broadway play The Amazing Dr. Clitterhouse (1936), which was adapted into a successful crime film with Edward G. Robinson in 1938. Lyndon made his screenwriting debut with the Hollywood remake of the Jack the Ripper film The Lodger (1944) and went onto deliver a number of psycho-thrillers of this era such as Hangover Square (1945) and The Night Has a Thousand Eyes (1948). His greatest success came in the 1950s with historical spectacles like The Greatest Show on Earth (1952), Sign of the Pagan (1954) and Omar Khayyam (1957). He is remembered here for his screenplays for the George Pal productions of The War of the Worlds (1953) and Conquest of Space (1955).